Cranes are an essential tool when constructing new buildings or repairing old ones. It is not a strange sight to see a skyline filled with cranes. Though they are a necessary piece of machinery, they can present risks to people in the cranes and to those below it. Proper operation and maintenance are essential in keeping a safe environment. If you have been injured or have lost someone you love in a crane accident, it is important that you consult a Crane Accident Attorney in order to understand your rights and get the compensation you deserve. 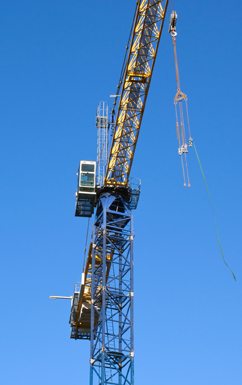 If you have been injured from a crane accident, call our Crane Accident Attorneys at the Orlow Law Firm. Contact us today at (646) 647-3398. The investigation is an important element of your case. Our Crane accident attorneys have over 30 years of experience handling Crane accident cases. We have received millions of dollars in compensation for our clients. We know how to protect your rights and ensure that you and your family are fairly compensated. If you have been injured in a Crane accident, you should contact a lawyer as soon as possible to discuss your rights to compensation. You will be assigned a personal partner of the law firm to work on the case. under the hook lifting device. crushing by the counter weight.